For many it insulting to the country, the President and the First Lady. American's need to write the London Times and the Charge d’Affairs Richard LeBaron in London protesting the photo, demanded its removal, the posting of a suitable one and an apology. We should not expect much from the Times given it is owned by Rupert Murdoch. We should expect an action from the Charge d’Affairs. We may also want to email the embassy, the White House, the Secretary of State’s office and anyone else you think should know demanding action. The Times of London has published a picture of First Lady Michelle Obama that is so insulting to the American People, the President and above all the First Lady that is so insulting that if you were a gentleman you would have no choice but to challenge both the editor and the owner to a duel to the death. Here is a copy of the most offensive picture. Since it is too much to expect a meager man such as yourself to uphold the First Lady and the country in this manner a simple beat down will do. the purpose of this beat down is to gain an apology for the people of the USA, the President and the dearly beloved First Lady, Michelle Obama and the publication of a more suitable picture. On that same note in the cause of improving FrancoAmerican relations you might find the time to have them post a more suitable picture of Madame Sarkosy. The one published gives her the appearance of Prime Minister Sarkosy’s slattern as opposed to his wife. I would appreciate a prompt action of your part. Has President Barack Obama engineered a quiet racial revolution in Washington, giving more power to black women than at any point in American political history? Well, according to Bill Shipman he has. Bill Shipman writes: While Mr Obama has played down the influence of race over his government and policies, Washington is abuzz that the president has handed control of domestic policy, all White House social events, environmental issues and food safety to African American women - seven senior government posts in all. Known variously as The Sisterhood and Obama's Women, the group of seven accomplished and elegant women have drawn comparison with "Blair's Babes", the generation of female Labour MPs whose election in 1997 caused an historic shift in the composition of the House of Commons. President Obama used his press conference last week to joke that interest in his own race lasted "about a day" after his election. But below the radar, Mr Obama has been quietly transforming the upper echelons of government. Black woman only hold 192,000 of more than 1.7 million government jobs, making up about one in nine of the federal workforce, but Mr Obama has given them one fifth of the most senior jobs in government. 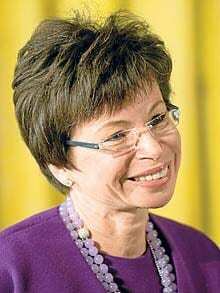 While media attention has focused on Michelle Obama, with her emergence as a fashion icon and cheerleader for her husband's policies, the First Lady's old Chicago boss, Valerie Jarrett, has emerged as one of her husband's three most influential advisers. Eleanor Holmes Norton, the African American who represents the District of Colombia as a non-voting member of Congress and was herself a pioneering head of Jimmy Carter's equal opportunities commission, told the Washington Post: "I'm not sure there's ever been a black woman who has enjoyed as much of the president's confidence as Valerie Jarrett. The Obama women are a sign of how far we've come. Black women have been preparing themselves for this day. They are more than ready." Bush administration officials, who say the former president treated Condoleezza Rice, the first black woman to be secretary of state, like a sister, might dispute that claim. But White House insiders say that Ms Jarrett speaks for the president with greater authority than all but his strategist, David Axelrod, and chief of staff, Rahm Emanuel. Mr Emanuel's deputy is Mona Sutphen, the first black woman ever to hold the title. She has already made her mark by engineering a softening of restrictions on travel to Cuba. With Hillary Clinton as secretary of state, women have a lock on Mr Obama's foreign policy and Susan Rice, his African American campaign adviser, holds the other high profile post, Ambassador to the United Nations. The most powerful figure in the domestic arena after Ms Jarrett is Melody Barnes, the head of Mr Obama's Domestic Policy Council, who oversaw the $787 billion economic stimulus package and will now play a key role in overhauling US healthcare and education policy. The impact of such high profile appointments has raised hopes that more positive images of black women will become prevalent in the media. The award winning black journalist Allison Samuels wrote: "The prevailing theory seems to be that we're all hot-tempered single mothers who can't keep a man and those of us who aren't street-walking crack addicts are on the verge of dying from Aids. "My 'sistafriends' are mostly college educated, in healthy, productive relationships and have a major aversion to sassy one-liners. Little is known about who we are, what we think and what we face on a regular basis." She says the new cadre of black women, led by Michelle Obama, "will become a stand-in for us all". The changing image of America's first family is also in the hands of the sisterhood, in the form of Desiree Rogers, who has long been a member of the Obama inner circle. Once married to John Rogers, a friend of Mr Obama and a Princeton basketball teammate of Mrs Obama's brother Craig Robinson, she is now the first black woman to become White House social secretary. Ms Rogers organised the series of receptions, cocktail parties and the Superbowl gathering Mr Obama used to throw the doors of the world's most famous residence open to Republican rivals and ordinary members of the public. Her responsibilities include organising activities for the first daughters, Malia and Sasha Obama. It is not just the Obamas who have benefited from her party organising prowess. She also hosted Ms Jarrett's birthday bash last November. HARRISBURG, Penn. - A retired police chief says he was robbed by "probably the dumbest criminal in Pennsylvania." Jerome Marquis Blanchett (R) says he's "smooth." It happened Friday morning at a hotel hosting a police officers' convention near Harrisburg that drew 300 narcotics officers from Pennsylvania and Ohio. John Comparetto says as he came out of a stall in the men's bathroom, a man pointed a gun in his face and demanded money. Comparetto, a retired police chief from New York, gave up his money and cell phone. But when the man fled, Comparetto and some colleagues chased him. They arrested 19-year-old Jerome Marquis Blanchett of Harrisburg as he was trying to leave in a taxi. Here is an interesting post about George Barich. 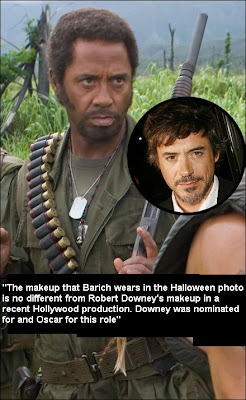 You see, this guy has made a name for himself, with controversy over his "blackface" photo. H/T Antoinette a regular at my blogtalkRadio program for the link. Another Post-Racial Moment? Now it appears that residents are asking for Barich's resignation after this city councilman got dressed up and played out his fantasy of being a black man. One has to wonder what other fantasies he wants to play out? He now writes in his blog: Keeping Cotati "funky" brought outrage from the Cotati Chamber of Commerce. What appeared to be an orchestrated move by a far-left fringe group of the Cotati Chamber of Commerce, three chamber members called for Barich's resignation at a city council meeting but failed to articulate exactly the reason why. 3-25-09: For fear of looking like racists themselves, speakers John Moore, Andre Morrow, and Cheryl Nixon stopped just short of offering an explanation as to what it is about this blog that offended them so much. It was very obvious that none of them wanted to begin to discuss who is "white", who is "black", and who really gives a damn while our town heads closer to bankruptcy each day. Perplexed faces from the audience confirmed that a political witch hunt was being performed right before their eyes. The Chamber has yet to come up with a plan to promote more economic development in Cotati, and appeared to be upstaged by a lone council member who is single handedly doing their job for them by recycling an old bumper sticker as a new slogan for the town, Keep Cotati Funky. At the meeting recess, Barich supporters and other chamber members thanked Barich for bringing attention to the blatant racism of people like Andre Morrow who claims to hold a monopoly of being the only Afro-American in the audience. For a town that strives to be more "color blind", it was clear Cotati city leaders were again, deeply disturbed by Morrow's comments. Morrow had been chastised by Mayor Guardino in the past for bringing racist comments into a city meeting earlier in the year. Cheryl Nixon embarrassed herself further by suggesting that other council members control the free speech of Barich on his private blog who will not conform to the far-left political agenda which is losing favor in town. No council action was taken. John Moore, who has previously promised Barich to run him out of town for his fiscal conservatism and for exposing John's Moore's Marxist's views, appeared sober, and suffered another huge personal defeat by not getting the support from the audience he had hoped for. For all of you folks who don't believe in the deception of the United States Congress and the deception of President Barack Obama check out this video and let me know what you think. Dallas Police Officer Should Be Fired! AAPP: More heartless bullying of black men by police, again ... caught on tape. This time it's Police delaying an NFL player from seeing his dying mother-In-Law. The NY Times says it best when they said, a Dallas police officer makes death even worse. The Dallas News is also on point when they write, Editorial: Dallas cop doesn't deserve his badge. As reported by the Associated Press, A Dallas police officer was put on desk duty after pulling over an NFL player rushing to see his dying mother-in-law in the hospital and holding him in the hospital parking lot as she died. Dallas Police Officer Robert Powell stopped Houston Texans running back Ryan Moats' SUV outside Baylor Regional Medical Center during the early hours of March 18 after Moats rolled through a red light. Moats and his family had gotten a call saying his mother-in-law was dying. Video from a dashboard camera inside the officer's vehicle, obtained by Dallas-Fort Worth station WFAA-TV, revealed an intense exchange in which the officer threatened to jail Moats. He ordered Moats' wife, Tamishia Moats, to get back in the SUV, but she ignored him and rushed inside the hospital to see her mother, Jonetta Collinsworth, 45, and was by her side when she died a short time later. She had breast cancer. "Get in there," said Powell, yelling at 27-year-old Tamishia Moats, as she exited the car. "Let me see your hands!" "Excuse me, my mom is dying," Tamishia Moats said. "Do you understand?" Moats explained that he waited until there was no traffic before proceeding through the red light and that his mother-in-law was dying, right then. Moats couldn't find his insurance paperwork, and was desperate to leave. "Listen, if I can't verify you have insurance...," Officer Powell said. "My mother-in-law is dying," Moats interrupted. As they argued, the officer got irritated. "Shut your mouth," the officer said. "You can either settle down and cooperate or I can just take you to jail for running a red light." By the time the 26-year-old NFL player received a ticket and a lecture from Powell, 25, at least 13 minutes had passed. When he and Collinsworth's father entered the hospital, they learned Collinsworth was dead, The Dallas Morning News reported in today's editions. The Moatses, who are black, said they can't help but think that race might have played a part in how Powell, who is white, treated them. "I think he should lose his job," said Ryan Moats, a Dallas native. Powell was placed on disptach duty pending an investigation. The ticket issued to Moats was dismissed, Lt. Andy Harvey told WFAA-TV. "There were some things that were said that were disturbing, to say the least," he told the Dallas Morning News. Powell told police officials he believed he was doing his job, said Dallas Police Assistant Chief Floyd Simpson. AAPP: What do you think should happen to this cops job? Should he be fired? Was he just doing his job? Enter, Cash Michaels at The Wilmington Journal who is following what is going on in North Carolina with Federal stimulus money. It would be wise that black leaders in other states follow their lead, and ask the questions and get the answers. Black leaders in N.C. seem to be doing what state and local black leaders in all states should be doing - holding the Gov. and the Barack Obama administration accountable. 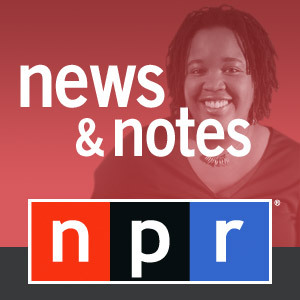 Cash Michaels reports on how black leaders are asking questions of the State and Federal government, like: What is the latest on how funding from North Carolina's $6.1 billion share of the Recovery Stimulus package will be distributed for projects through the state and cities? What will the process for application for those stimulus projects be, and when will it be announced and get underway? And how can African-Americans be assured, despite guarantees of transparency and accountability from the Obama Administration, that blacks looking for jobs and business opportunities won't get locked out? ''This plan's already saved the jobs of teachers and police officers. It's creating construction jobs to rebuild roads and bridges,'' Pres. Obama told the nation during his prime time White House press conference Tuesday night. But is it happening yet in North Carolina, especially for African-American? That's the pressing question black leaders across the state are asking, and wanting fast answers to, to ensure that North Carolina's African-American community is not left out of Obama's historic efforts to jumpstart a crippled economy with his $787 billion two-year American Recovery and Reinvestment Act. Next week they may get answers. The Carolinian/ Wilmington Journal has learned that Dempsey Benton, Gov. Beverly Perdue's Recovery and Reinvestment Office (www.NCRecovery.gov) point man to oversee North Carolina's stimulus projects effort, has agreed to sit down with the NCNAACP and other statewide leadership April 2 to examine issues surrounding how African-Americans can better access the process. ''We want to discuss issues of parity, equity, diversity, control, the need for regional summits for African-Americans and other [people of color] to come in and know exactly what's going on,'' Rev. William Barber, president of the NCNAACP told The Carolinian/ Wilmington Journal exclusively Wednesday. The Carolinian/The Wilmington Journal has also learned that Gov. Perdue has agreed to meet with the NCNAACP and others during a ''civil rights roundtable'' on April 20th to further discuss the stimulus package impact on the black community, in addition to other social agenda issues. The Questions have poured in at President Barack Obama's Town Hall Meeting. As reported by CNet.com, President Barack Obama is turning directly to the public to win support for his economic proposals in ways unseen from any president before him, and on Tuesday he continued that by introducing a new feature on WhiteHouse.gov called "Open for Questions." The new feature, modeled after the "Open for Questions" tool on Change.gov, allows users to ask a question about the economy, as well as vote for or against others' questions. On Thursday morning, the president will hold an online town hall meeting on the economy, streamed on WhiteHouse.gov, and answer some of the most popular questions from the tool. "One of my priorities as president is opening up the White House to the American people so that folks can understand what we're up to and have a chance to participate themselves," Obama says in an introductory video at the "Open for Questions" page. "We're going to take advantage of the Internet to bring all of you to the White House to talk about the economy...This is an experiment, but it's also an exciting opportunity for me to look at a computer and get a snapshot of what Americans across the country care about. We may not always agree on everything, but this way, I can get a sense of your concerns and give you some straight answers." After visitors set up an account on WhiteHouse.gov by submitting their name, e-mail address, zip code, and choosing a password, they can submit or review questions in a number of different categories related to the economy: jobs, health care reform, education, home ownership, veterans, auto industry, financial stability, green jobs and energy, retirement security, small business, and budget. 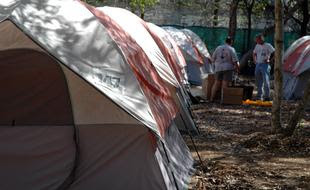 AP reports, At a time when millions of Americans are losing their jobs and their homes, President Barack Obama says he's "heartbroken" that any children are without a roof over their heads. Obama says the "most important thing" that he can do for those children is make sure that their parents have jobs. And he again pointed to his plan to save or create 3.5 million jobs through his economic stimulus package. He says in the meantime, he wants to work with states to help those who are "falling through the cracks." And the president told reporters at a Tuesday evening news conference that there needs to be a "change in attitude" in the country, so that it isn't seen as "acceptable" for children and families to be homeless. 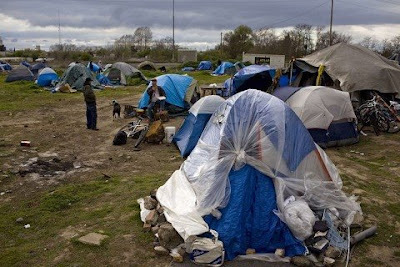 AAPP: Yes Rude Pundit is right, "Obama's answer, a combination of sorrow for the poverty and restatement of his budget proposals as they relate to jobs and veterans, was pretty much what you'd expect." You see, everyone is beginning to see the deception. I agree with Barney Frank a number of political issues lately, including his comments that retention bonuses are extortion, however it seems that Congressman Frank is growing old and tired, and is forgetting his own roots in Massachusetts politics. It seems that Barney Frank dislikes political activism. Well, at least not the type of "in your face" political activism that Code Pink throws down. Yes, Barney Frank dealt two severe smackdowns Tuesday. As reported by the Huffington Post, Barney Frank, chairman of the House Financial Services Committee, smacked down code pink and other political activist, amidst testimony from Treasury Secretary Timothy Geithner and Federal Reserve Chairman Ben Bernanke. "Will you act your age and stop playing with that sign?" Frank asked the activists, on hand to wave signs requesting bailouts. "We really need people to grow up." Obama Takes On The Press - Is It Obama Deception? AAPP says: I listened to Barack Obama last night, with the back drop of a recent articles, blog post and reports with 'sobering statistics' on racial inequality along with a recent article I read in the NY Times by Paul Krugman regarding Obama's financial policies. Paul Krugman also writes, "Mr. Obama has apparently settled on a financial plan that, in essence, assumes that banks are fundamentally sound and that bankers know what they’re doing. It’s as if the president were determined to confirm the growing perception that he and his economic team are out of touch, that their economic vision is clouded by excessively close ties to Wall Street. And by the time Mr. Obama realizes that he needs to change course, his political capital may be gone." Krugman also says, Let’s talk for a moment about the economics of the situation. Right now, our economy is being dragged down by our dysfunctional financial system, which has been crippled by huge losses on mortgage-backed securities and other assets. As economic historians can tell you, this is an old story, not that different from dozens of similar crises over the centuries. And there’s a time-honored procedure for dealing with the aftermath of widespread financial failure. It goes like this: the government secures confidence in the system by guaranteeing many (though not necessarily all) bank debts. At the same time, it takes temporary control of truly insolvent banks, in order to clean up their books. But the real problem with this plan is that it won’t work. Yes, troubled assets may be somewhat undervalued. But the fact is that financial executives literally bet their banks on the belief that there was no housing bubble, and the related belief that unprecedented levels of household debt were no problem. They lost that bet. And no amount of financial hocus-pocus — for that is what the Geithner plan amounts to — will change that fact. You might say, why not try the plan and see what happens? One answer is that time is wasting: every month that we fail to come to grips with the economic crisis another 600,000 jobs are lost. AAPP: Yes, Mr. Obama just may be squandering his credibility with black folks. He also seems to be squandering his credibility with a number of middle class black organizations such as the National Urban League. You see, the Urban League President recently said, "President Barack Obama should specifically address disparities in black unemployment, foreclosures, education and health care, the "National Urban League" in its annual “State of Black America” report. Yes, finally middle class black folks are seeing the facts, and speaking up and out. Yes, the election of the first black president is great, yet, black folks, as the Urban League reports, are twice as likely to be unemployed, three times as likely to live in poverty and more than six times as likely to be incarcerated. 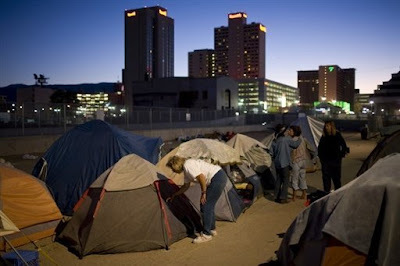 _ Ensure that the stimulus package’s green job creation includes poor urban communities. _ Increase funding for job training and placement for disadvantaged workers. _ Guarantee full-day schooling for all 3 and 4 year olds. _ Expand the school day to account for working parents and families without nearby relatives to help with after-school care. _ Fund mortgage counseling and education programs for minorities. _ Implement universal health care and a “comprehensive” system to provide blacks with health education, prevention and intervention. AAPP: It seems to me that the Trillion dollar give away, and other bail plans supported by Barack Obama, will have an end result of giving away American homeowners hard earned equity back to big business interest, will gentrify urban communities, and make sure that black and latino urban dwellers will not be able to afford to live in urban cities across America. H/T The Raw Story, along with Dale and Justice 4 US, for the link. In an essay published Monday, the head of China's central bank proposed a plan to displace the American dollar as the world's standard and replace it with a global reserve currency operated from the International Monetary Fund. "Zhou Xiaochuan, governor of the People’s Bank of China, argued that what he called a super-sovereign reserve currency would not only eliminate the risks inherent in currencies such as the dollar, which are backed only by the credit of the issuing country and not by gold or silver, but would also make it possible to manage global liquidity," reported the Times Online. "But that's unlikely to happen, says Robert Scott, senior international economist with the Economic Policy Institute," reported Forbes. "'It's partly posturing, it's partly buyer's remorse,' he said, noting China, at some point, is going to have to let its yuan currency rise in value relative to the dollar's current price – likely by upwards of 30.0%. That means China's investments in U.S. dollars, via Treasuries, would lose a third of their value in yuan terms. "'hey're getting hammered,' Scott said. Chinese leaders' heavy investment in the U.S. economy has exposed them to domestic criticism." "Zhou made his call in an essay that appeared on the website of People's Bank of China, China's central bank, on Monday," reported the Washington Post. "It was clearly timed to make a splash in the run-up to the G20 meeting that starts in London on April 2. "Calling the use of the dollar as the world's benchmark currency 'a rare special case in history,' Zhou urged the 'creative reform of the existing international monetary system towards an international reserve currency.' Zhou said the reserve currency, managed by the IMF, should be 'disconnected from individual nations and is able to remain stable in the long run.'" 4 Oakland Police dead - "Hate begets hate; violence begets violence" in Oakland, CA.
" Hate begets hate; violence begets violence" in Oakland, California. First it's the fatal shooting of unarmed 22-year-old Oscar Grant by a transit police officer at an Oakland train station on Jan. 1, 2009, now it's 4 police officers dead. MSNBC and other news agencies report police are saying they don't know exactly why the officers initially stopped the suspect, but said it apparently was a routine traffic stop. Images released by the Oakland Police Department, from left, Sgt. Mark Dunakin, Officer John Hege, Sgt. Daniel Sakai and Sgt. Ervin Romans. A man wanted for violating his parole killed three police officers and gravely wounded Hege during the in two shootings on Saturday. OAKLAND, Calif. - MSNBC reports a police officer was battling for his life and three more were dead after a parolee with an "extensive criminal history" opened fire at a routine traffic stop and hours later gunned down members of a SWAT team searching for him. The gunman was also killed Saturday, capping a day of violence that the Oakland Police Department said was the worst in its history. Never before had three police officers died in the line of duty on the same day. "It's in these moments that words are extraordinarily inadequate," said Mayor Ron Dellums at a somber news conference Saturday night. The mayhem began that afternoon, when two motorcycle patrol officers stopped a 1995 Buick sedan in east Oakland, Oakland police spokesman Jeff Thomason said. The driver opened fire, killing Sgt. Mark Dunakin, 40, and gravely wounding Officer John Hege, 41. The gunman then fled on foot, police said, leading to an intense manhunt by dozens of Oakland police, California Highway Patrol officers and Alameda County sheriff deputies. Streets were roped off and an entire area of east Oakland closed to traffic. About two hours later, officers got an anonymous tip that the gunman was inside a nearby apartment building. A SWAT team had entered an apartment to clear and search it when the gunman shot them with an assault rifle, police said. Sgt. Ervin Romans, 43, and Sgt. Daniel Sakai, 35, were killed and a third officer was grazed by a bullet, police said. SWAT team members returned fire, killing 26-year-old Lovelle Mixon of Oakland, Acting Oakland police Chief Howard Jordan said. Officer Hege suffered brain damage and may not survive, his father, Dr. John S. Hege, said late Saturday. "It is a stunning thing to face," he said. On Sunday, Mixon's family defended the 26-year-old parolee. The Oakland parolee who took the lives of four Oakland police officers knew he was a wanted man and deliberately skipped out on a meeting as part of a feud he was having with his parole agent, his family said today. Lovelle Mixon's shocked family, gathering at an East Oakland home where the parolee had been living until recently, apologized to the officers' families and to the public, and said they don't understand what might have triggered his burst of violence. "He's not a monster," said his sister, 24-year-old Enjoli Mixon, whose apartment on 74th Avenue was where Mixon was slain in a gun battle with police that left two Oakland SWAT officers dead. "I don't want people to think he's a monster. He's just not. He's just not." "We're crushed that this happened," said his grandmother, Mary Mixon. "Our hearts and prayers go out to the officers' families....This shouldn't have happened." Lovelle Mixon was on parole arising from an offense in San Francisco. Mixon was convicted of assault with a deadly weapon stemming from an armed robbery in robbery in San Francisco, the family members said. He initially served six years, and then served another nine months after violating his parole when he got out. The fact of he matter is the city leadership, police and residents are going to have to come together quickly. Tensions are high as Oakland residents struggle with this latest tragedy. The bottom line is these Police deaths amplify this city's problems. Black Women get Double Life Sentence for $11.00! Mississippi gave Gladys and Jamie Scott each a double-life sentence in an armed robbery where no one was murdered or harmed and the amount alleged to have been taken was a whopping $11.00. 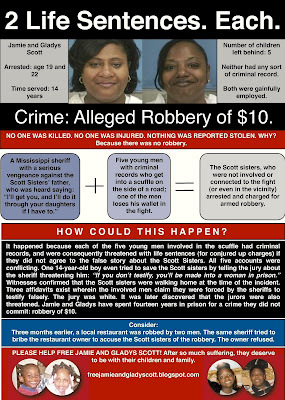 H/T and Shout Out to Nancy Lockhart, M.J.
Scott County, MS ---- In a trial fraught with legal malpractice and witness coercion, Mississippi Judge Marcus Gordon oversaw one of the most blatantly corrupt trials in history, culminating in the staggering over-sentencing of sisters Gladys and Jamie Scott to double-life each in an armed robbery where no one was murdered or harmed and the amount alleged to have been taken was a whopping $11.00. On December 24, 1993, the Scott County Sheriff’s Department arrested the Scott sisters for armed robbery even though three young males, ranging from ages 14 to 18, confessed to committing the crime. Despite this, the corrupt Mississippi sheriff used coercion, threats, and harassment to compel them to turn state’s evidence against the Scott sisters due to a long-standing vendetta against a family member. The 14-year-old male would later testify that he did not read the statement and was pressured to sign a written statement prepared by the sheriff without an attorney being present. As if that weren't bad enough, these young women received incompetent legal representation at the lower court trial. Their attorneys, Firnist J. Alexander, Jr. and Gail Shaw-Pierson failed to interview and subpoena witnesses, only calling one witness when there were several. Incredibly, the jury never even heard any testimony from the alleged victims. The sisters were advised to not testify on their own behalf by their attorneys, Alexander and Shaw-Pierson, denying them the opportunity to speak for themselves. In October of 1994, Jamie and Gladys Scott were sentenced to extraordinary double life terms each in prison, even though neither sister had prior convictions and there was no violence involved in these charges. The four State’s witnesses provided conflicting testimony and one alleged accuser was not called to testify – he was not questioned or subpoenaed by defense attorneys Firnist J. Alexander, Jr. or Gail Shaw-Pierson. Witnesses admitted however, that reports prepared by the Sheriff, of their descriptions of the event contained no such claim. In other words, the sisters were not present. Jamie and Gladys Scott were not involved in the armed robbery and they did not conspire to plan such. Witnesses all testified that they were coerced and threatened by Deputy Sheriff Marvin Williams. Testimony also revealed that Marvin Williams prepared statements of the events from the night of December 24, 1994 BEFORE obtaining signatures and BEFORE the witnesses were brought into his office. In other words, the statements were not written by witnesses. (1) Three affidavits exist – they all state that the Scott Sisters were not involved in this robbery. One affidavit is written by a trustee of the local jail, his account of the facts reveal that a wallet was located a few days after this alleged robbery and that wallet contained the photo ID of one of the alleged victims of the trumped up robbery and three twenty dollar bills. The trustee also reveals that there was NOT a robbery, he was also threatened to be sent to Parchman Penitentiary if he told the truth. According to the Request for Commutation of Sentence and/or Pardon prepared by attorney Chokwe Lumumba, the Scott Sisters challenged their convictions on direct appeal; arguing that there was insufficient evidence to convict them, and the guilty verdict was against the overwhelming weight of evidence, which should have exonerated them. The court of appeals found no error and affirmed the convictions on December 17, 1996. As a result, they filed a Petition for Writ of Certiorari to the Supreme Court, which was denied on May 15, 1997. They consequently filed an Application for Leave to File Motion to Vacate Conviction pursuant to the Mississippi Post Conviction Collateral Relief Act. The Supreme Court also denied that application. This family is shell-shocked, yet determined to fight on. They have tried to have faith that at some point this unbelievable travesty would be corrected and their upside-down lives righted. Yet 14 long years later nothing has changed, the women's five children are still being raised by their now ailing mother, and their father has died of a massive heart attack because of this. The emotional strain this burden has placed upon their family is immeasurable. Jamie Scott writes, "What began as an implication and outright miscarriage of justice, has catapulted to destroy an entire family. Gladys was a 19 year old pregnant mother, and myself, Jamie, a 22 year old mother during the time of our arrest, conviction and sentencing for a crime we did not commit." 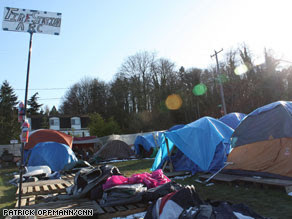 She continued, "We are convinced that once this chain of events is exposed and unraveled, the events that occurred, the lives that have been destroyed, the pain and suffering the citizens of Scott County have endured; everyone will be utterly amazed, astonished and compelled to assist us in our plight for freedom. We pray that the people would insist upon an investigation into their misconduct and miscarriage of justice." Gladys and Jamie’s older brother has recently returned from Iraq and has served in the US Army for 22 years, while his sisters remain victims of wrongful convictions in the very country that he proudly represents. The defendants and their family are wholly depending on support from the press, organizations, and all those dedicated to justice in making this debacle as public as possible. Please call the Governor’s office and ask to speak with Governor Haley Barbour. Please relay the message below. Hello Governor Barbour I am calling in support of The Committee To Free The Scott Sisters. I would like to bring to your attention the case of Jamie and Gladys Scott. The Scott Sisters have served 14 years 5 months of a double life term where no one was murdered or injured. State’s witnesses have testified to their innocence. Their MDOC numbers are 19197 and 19142. Please free the Scott Sisters. Thank you for your attention to this matter Governor Barbour. Thank you for your assistance in The Campaign ~To Contact The Governor Of Mississippi!
" Sorry buddy, you've still got the job."